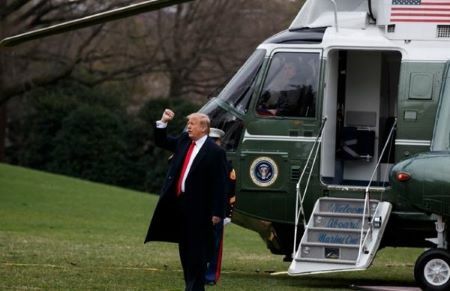 U.S. Acting Defense Secretary Patrick Shanahan briefed President Donald Trump as he was traveling to Florida on Air Force One, spokesperson Sarah Sanders said. The Syrian Democratic Forces have yet to announce a final territorial defeat of Daesh in its last enclave in Baghouz and said on Friday that though it has captured most of the area, there are still pockets of militant fighters. A Reuters journalist at Baghouz heard airstrikes there on Friday afternoon and saw smoke rising. The SDF has been battling for weeks to defeat Daesh in Baghouz in southeastern Syria at the Iraqi border, all that remained of the territory the militants ruled, which once spanned a third of Syria and Iraq. Mustafa Bali, head of the SDF media office, told Reuters SDF fighters had captured most of the Baghouz area and clashed overnight with Daesh militants in more than two positions where they were refusing to surrender. The militants were holed up in what appeared to be caves in a rocky shelf overlooking Baghouz, and in trenches by the nearby Euphrates River, he said. "Our forces are trying to force them to surrender, but so far the clashes are continuing." Though the defeat of Daesh at Baghouz ends its grip over populated territory, the group remains a threat, with fighters operating in remote territory elsewhere and capable of mounting insurgent attacks.